Rose Bakery was on my list of bakeries to visit when Erin, my husband and I went on our honey moon to Paris in 2014. A few foodies mentioned the bakery as a must see and of course we immediately had it on our bucket list. I must mention that we also visited 9 bakeries in total and even did a search for the best croissant adventure (which sadly ended up in concluding that the best croissant is from Tartine Bakery in SFO!). However Rose Bakery really inspired and satisfied our foodie cravings. And of course I came back ready to make my version of this divine cake and who does not love a very good carrot cake? This as a pound cake reminds me of the French Gateaux de Voyage/ travel cakes I really love! I have made so many carrot cakes I probably can’t recall how many, but I do know that when you find a recipe you love these standards are hard to beat. Enjoy and explore this new cake. It’s all about proportions and balance. Preheat convection oven to 165 c.
Grease and line the bottom of a pound cake pan with parchment paper. Or use a silicone pan. Sift flour, leavening and spices. In a large bowl by hand, mix with a whisk: eggs, vainilla, sweetener. Add oil and mix to combine. Add flour and mix until integrated. Pour batter into prepared pan. Bake until a toothpick comes out clean approx. 20 mins. depending on the pan and oven. Remove from oven, let cool for about 10 -15 mins, unmold onto a perforated tray or cooling rack. Let cool completely. Decorate with either the healthy confectioner’s sugar or the frosting. In a Kitchen Aid mixer with a paddle: mix butter, confectioner’s sugar, vanilla, salt and cream cheese until creamy. 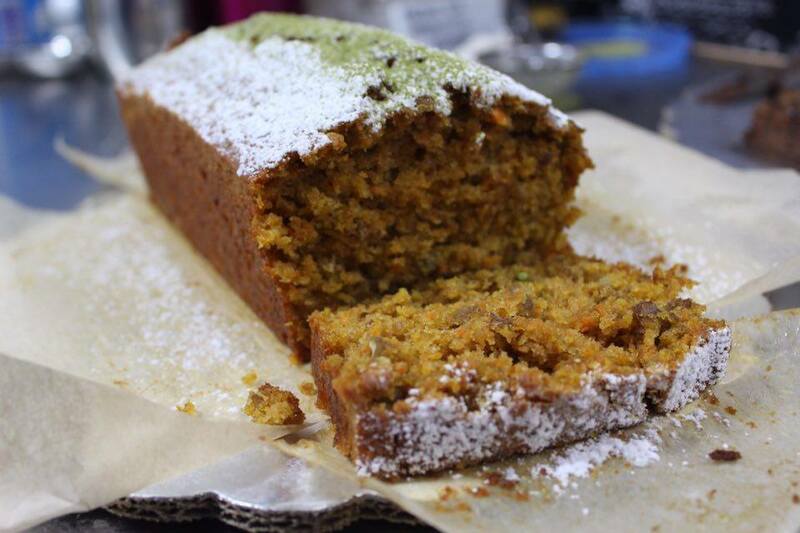 I made this cake with zucchini and it was very good, it pairs very well with ground ginger and ground coriander! Or you can combine carrot and zucchini or zucchini and grated sweet potato go very well. Question: Can the frosting be made without a Kitchen Aid mixer? If I make it with zucchini, do I need to squeeze out the liquid before mixing? If you grate the zucchini and it’s not watery I would add it as is. If it’s watery yes squeeze out the liquid. Let me know how it turns out. I hate spam as much as you do! I’ll only be sharing my best recipes and special offers. You can unsubscribe from receiving my emails at any time. Hey Buddy!, I found this information for you: "ROSE BAKERY NOBLE CARROT CAKE". Here is the website link: https://www.vanessamusi.com/rose-bakery-noble-carrot-cake/. Thank you.